Art is everywhere, it is an object, it can be found in advertising, nature, clothing, people, etc. Art is not just a painting or drawing, it makes up everything in life. It can be a lifestyle or a perspective. Let’s say someone has a new purse, a purse is an object created by man, therefore it is art. When you compliment the caretaker of this purse it creates communication. That’s my idea or thought of it. It can also be as simple as looking at a painting and feeling something from it, such as love, or happiness, which you can express to another person or thing. How does Material Culture influence artistic decisions? It influences how you see the world, what you buy, or what you give and take. It can also influence where you want to go when you grow up, what you decide to be or who you work for. Either being materialistic or the type of person who goes with the flow. From an artist's standpoint I have a sketched out plan of what something may look like or feel like, sometimes I start off with an idea and then it turns into something entirely different. In order to make something you must have the right attire, whether that be paint brushes, a pencil, or a piece of fabric. As an artist it is always helpful to have a sketched out plan or idea first. For most directors or cartoon producers it is necessary to have a team brainstorm or a storyboard in order to see what will happen next and what needs to be positioned. In our first week of this project we practiced our skills in Adobe Flash and made storyboard sketches. It was helpful to have this extra week of practice and it prepared me for my final video. My partner and I worked on our video over the weekend, we asked to borrow Roxy’s camera and tripod over night and I was glad she gave us that trust. I worked in Adobe Flash and created our title, it became very confusing to me very fast. After advocating for myself and asking for help from a peer I was able to finish our title which I was very proud of. My partner edited the video and music and we finalized it together. I feel that we are both very proud of our final video and can’t wait for you too see it! Sometimes when Roxy is away we get a substitute and are able to explore our abilities. Showing all the pictures I used to make one piece of art. I am always questioning things that surround me. I notice shapes and designs in things many people don’t even realize or notice. When I was growing up I always loved art, I would finger paint draw and just play around with colors, I was very intrigued by small designs and figures especially the stars. Every night in the summer I would go out onto my playground with a pillow and blanket and watch the stars, making a wish on the shooting stars that would pass by every now and then. I was so amazed by how they looked and the different astrologies you can find. I liked looking at the stars because I was alone and I could think about things and question things I’ve never questioned before. I’ve always have had a outgoing bright personality, just like stars. I hope you enjoy my art and the many more pieces to come. For the Teacher Creature project there were many steps to making it look great. I first picked out a couple of teachers I would like to make into creatures. I chose Crystal Pennington and Ashely Carruth, I asked them questions like, whats your favorite color? Top worst fears? Favorite super hero? Spirit Animal? etc. Ashely’s worst fears are falling of a cliff, Teletubbies, and Oompa Loompa’s, her favorite color is dark green, she loves Disney’s Mulan, and her spirit animal is a mountain goat. For Crystal she has a fear of students (I would also) and time, her favorite color is red/turquoise and her spirit animal is a grey hound, she loves Bat Man. 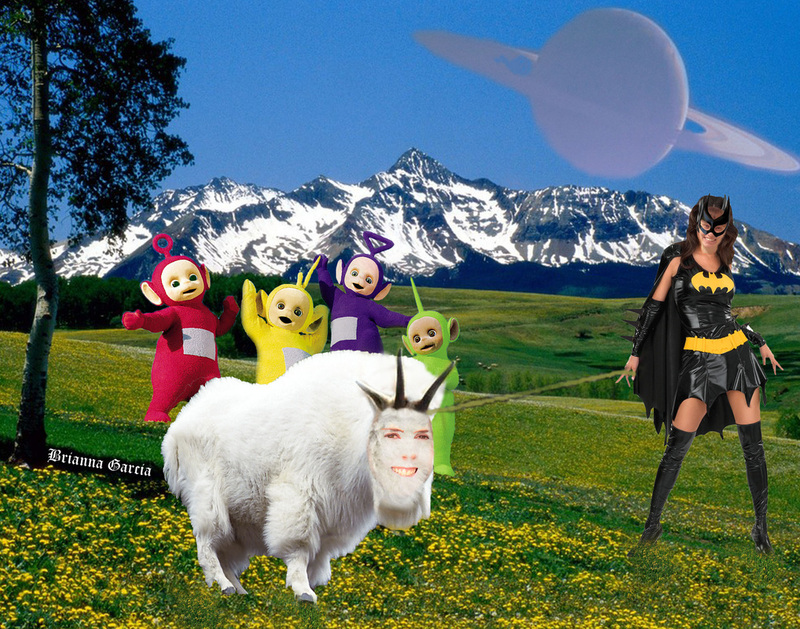 I had the best picture in my mind and put it to work, I decided to take some of there answers and turn it into a crazy picture filled with Teletubbies, Bat-Women, a mountain goat, scenery of beautiful Colorado mountains. I fixed the hue and saturation of Crystals face so it would be a little more tan like the model of Bat-Women. Ashely’s face was a bit more difficult to make into a mountain goat. I cropped her face and use the selection tool to make it fit the goats face, I then turned down the opacity so it would match a bit more. I copied some of the goats fur and pasted it on her face so she would have the texture and look of a goat. I then used the erase tool to erase the fur out of her eyes, nose, and mouth, to make it look realistic. the rest was easy. I just used the size tool (command t in photoshop) and opacity to make different things fit in. I wanted to add one more thing so I put a planet in the background and made the sky look as if saturn was floating there. We saved multiple picture (TeacherCreatureProject version1, version 2, version 3, so on) After I finished my final copy I saved it and posted it and relaxed. I had lots of fun making this in photoshop, one thing that was a problem was making it look more realistic, obviously its not going to be very real with Bat-Women and Teletubbies floating around but I wanted to make sure it looked good and caught the eye. I finally finished the project and saved it to my flash drive and after a day I of course, lost the flash drive and wasn't able to save my final project as a JPEG and post it to my digital portfolio. I went crazy looking for it and as I was standing in class my lovely friend Mattie found it in her bag, I saved it and posted everything to my DP before I could lose it again. I was happy to have it all revised and finished. My favorite part of this project was putting all the pictures together and making an art piece. I thought it was the funniest thing and it was great to look at other people’s teacher creatures. I liked when Roxy gave us our tasks and we all got to work on our project. I did a lot of things in photoshop I could never do before and that was exciting for me to learn new and more things. 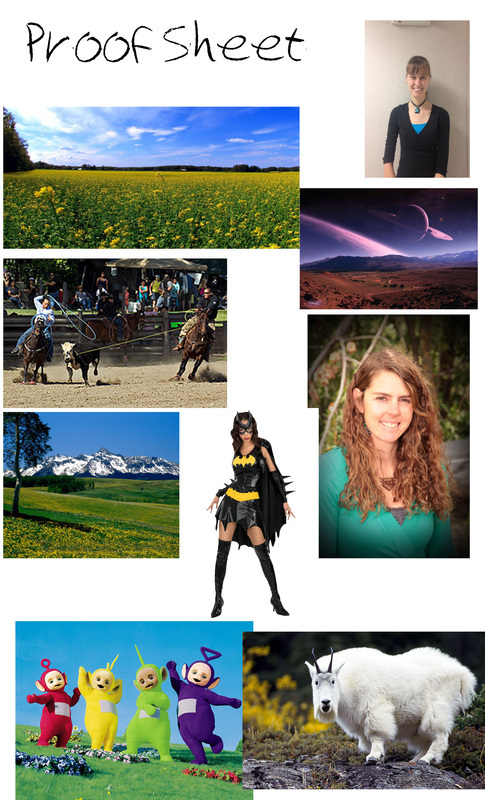 As a student I feel I can accomplish more in photoshop and make more art I enjoyed making the Teacher Creature and I’m excited to see the Ashely and Crystal’s expressions when they see there faces on Bat-Women and a Mountain goat. As a student I learned that I have more of a growth mindset because I had barely any idea of what to do in photoshop and now I can warp, change color, use text, change hair color, eye color, lip color, and many more things. I was really happy to learn all these new things and hopefully I can learn more. The teacher creature had many difficulties but was fun to find new things by myself, lets hope the teachers like their creatures. In photoshop I changed this girls hair color using the paint tool and the erase tool. ﻿In photoshop I changed this girls eyes and lips using the pen tool and to change the color I used the hue and saturation. Foreground: Objects closest to you. My foreground shows three teenagers and a small squirrel in the left corner. You can see the texture, contrast, and its detailed. Middle ground: The middle ground is the object in the middle, not to close, but not far to were it is blurred. The color becomes less vibrant and its a bit blurred. My middle ground shows a skate ramp and stairs on the right.